by Colin Tudge. 452pp, drawings by Dawn Burford, figures. What is a Tree? 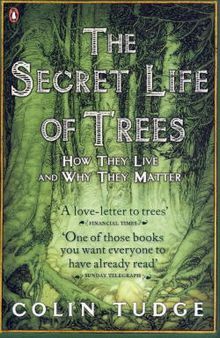 questions the origin and nature of trees; All the Trees in the World looks at Conifers, Magnolias and other Primitives, Thoroughly Modern Broadleaves, and so on; The Life of Trees discusses How Trees Live, Which Trees Live Where, and Why, and The Social Life of Trees: War or Peace? The final section, Trees and Us, speculates on the future. Paperback edition.